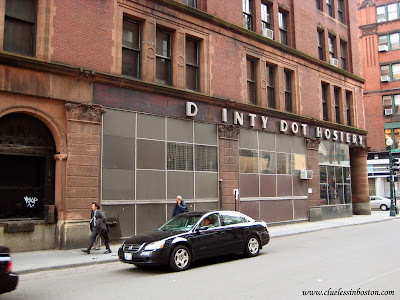 The Dainty Dot Hosiery building on Kingston Street, a six story 53,000 sq. foot building, was built in 1889 in what was once a residential neighborhood. It is on the National Register of Historic Places because of its location in a once-significant textile district. A large portion of the building was lopped off in the mid-1950s, which reduced it to its present size, to make way for the Central Artery Project. It was sold last year (Nov. 2006) to a local businessman for $9 million. Hopefully, its status on the National Register of Historic Landmarks will prevent its exterior from being altered or modified. Great buildings you have there - let's hope they are all preserved as is. Love the "d-inty dot" - very catchy!!! !